The countdown is on to the Good Friday derby between Wigan and St Helens - a rematch of the season's opening game. Saints won the January clash 22-12 and after 10 rounds, lead the Super League table on 18 points - while Adrian Lam's side are in 10th, with six points. Fans should expect confirmation this week that Shaun Edwards has made a U-turn on his commitment to coach his hometown club in 2020 in favour of extending his stay with the Wales RU national set-up. Today: The RFL's match review panel will announce late-afternoon whether any players are facing charges and suspensions from the weekend. And Wigan will be under sharp focus after Wakefield coach Chris Chester questioned the legality of some of their tackles around the knees on Friday night. Prop David Fifita followed that up with a social media post lashing out at "cheap s**t" and featuring a video of a tackle which he claimed could jeopardise his career. Sam Powell was placed on report for one challenge but the MRP views the full game and Adrian Lam will be hoping they avoid suspensions. Also, at 6.30pm, Wigan will discover who they will face in the Challenge Cup sixth round - between May 9 and 12. Ex-Saints Paul Sculthorpe and Jon Wilkin will make the draw. Tomorrow: Lam and counterpart Justin Holbrook will be at the DW Stadium for a joint press conference ahead of the match. In addition to their contrasting form, expect Lam to provide updates on his injured players - and face questions about whether he would extend his stay as Warriors coach in light of the development with Edwards. Any players facing disciplinary charges, and wanting to contest either the charge or the punishment, will face the panel on Tuesday evening. Wednesday: At noon both clubs will reveal their 19-man squads. Will Joe Greenwood be passed fit after a head knock? Will Ben Flower and Sean O'Loughlin return? And look out for interviews, with Saints' Lachlan Coote and Wigan's Zak Hardaker scheduled for media duties. Thursday: Sky Sports will screen a tribute to Eddie Hemmings ahead of his final match as their lead commentator on Good Friday. The voice of the network's rugby league coverage for decades, he is hanging up the microphone after the Wigan-Saints derby. Sky Sports have yet to reveal who will succeed him as their lead commentator. And don't forget the Wigan Post will feature an eight page pull-out! 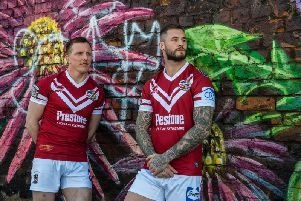 Friday: Game day - and the Warriors have marketed the game heavily - with a Game of Thrones-theme - in the hope of attracting a bumper crowd to the DW Stadium. Kick-off is 3pm. Fans are invited to bring an Easter egg and exchange it for a match-day gift at the fans zone in the south east corner of the stadium. Several Warriors stars will present the eggs to children at Alder Hey, Derian House and the Rainbow Ward at Wigan Infirmary the following day. Eggs can also be donated at Central Park, on Montrose Avenue, or Revolution Bar this week. Warriors Community Foundation manager Mike Wearden said: "Last year we collected an amazing amount of Easter eggs and the players did an unbelievable job in delivering them around the town."